Envistacom has been selected by the U.S. Army Program Executive Office Command Control Communications-Tactical (PEO C3T) and has been awarded a Prototype Project Subagreement through an Other Transaction Agreement (OTA) with Consortium Management Group (CMG) on behalf of Consortium for Command, Control and Communications in Cyberspace (C5) to develop the upgraded Phoenix satellite system prototypes, in an effort to modernize the U.S. Army tactical satellite communications platform. Cybersecurity threats to MILSATCOM are a relatively new phenomenon yet have quickly come to the forefront of concern for the sustainability of satellite systems due to the vulnerabilities that such threats may exploit and negatively impact. These mission-critical vulnerabilities include launch systems, communications, telemetry, tracking and command, and mission completion. They and other aspects of satellite communications depend heavily on secure and resilient cyber capabilities for all stages of the satellite’s lifespan. 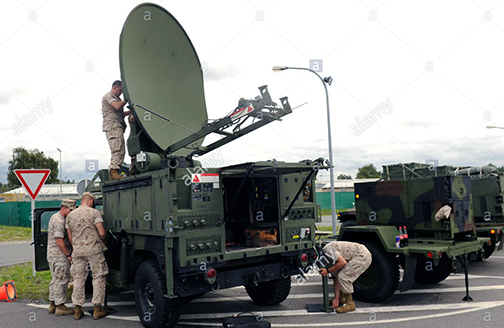 U.S. Marines set up a Phoenix satellite terminal in Grafenwoehr, Germany. Photo is courtesy of Alamay.com. The Envistacom Phoenix satellite terminal provides Expeditionary Signal Battalions (ESBs) with high-capacity, tactical, satellite communication to enable inter- and intra-theater range extension for networked battle command and control information, including logistical, operational, intelligence and administrative data. Envistacom will develop system upgrades and enhancements resulting in a more agile system that is relocatable and maneuverable, reducing size, weight, and power, enabling faster deployment, greater protection from detection, and a reduced dependency on dedicated vehicle transport. Envistacom will expedite a typical five-year development cycle into just 18 months, including a rigorous testing and certification phase in close collaboration with U.S. Army Project Manager Tactical Network (PM TN) Phoenix program office. In addition, Envistacom’s cybersecurity team will integrate new and effective concepts toward solutions in awareness, resiliency, and threat-based defense for the Phoenix terminals using a balanced security posture that combines classic cyber defense approaches with a new emphasis on leveraging cyber threat intelligence to respond and adapt quickly to cyber-attacks. Dr. Ebonese Olfus, VP of Cyber Strategy and Emerging Technologies for Envistacom In support of the Phoenix program said that Envistacom’s cybersecurity team will collaborate with the company's government sponsors and industry partners to adopt effective new concepts and apply solutions in awareness, resiliency, and threat-based defense to all Phoenix terminals. Alan Carson, SVP, Envistacom, added that deployed U.S. Army warfighters need modernized systems that are resilient and reliable to support global missions. Envistacom is the correct partner to deliver the next generation Phoenix system with resiliency and mobility to enhance mission flexibility and improve readiness.